Paul Goldschmidt is the latest Major League Baseball star to agree to a rich new contract. 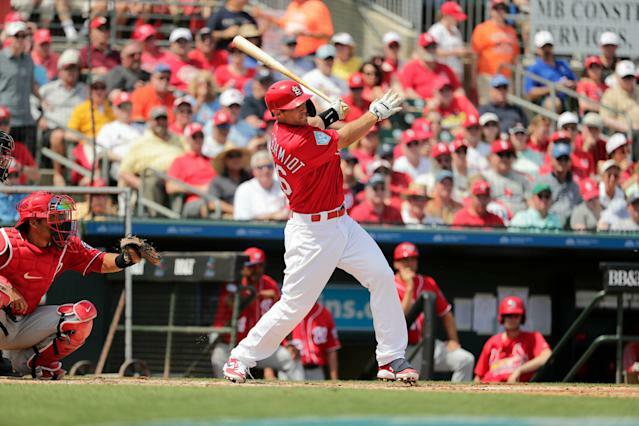 The St. Louis Cardinals announced Saturday that they have signed Goldschmidt through the 2024 season. Terms of the deal were not disclosed. The St. Louis Post-Dispatch reported Thursday that the new deal is “worth around $130 million.” The Athletic first reported the agreement. Goldschmidt, 31, was traded to the Cardinals in the offseason after eight seasons starring for the Arizona Diamondbacks. The power-hitting first baseman has made six consecutive All-Star games and has hit at least 30 home runs in four of the last six seasons. He also has three 100-plus RBI seasons under his belt. Overall, Goldschmidt has accumulated 209 home runs, 710 runs batted in and career averages of .297 and .398 in batting average and on-base percentage, respectively. Before the two sides reached a deal, Goldschmidt was owed $14.5 million for 2019 but was set to become a free agent following the season. Now, the Cardinals have the slugger locked up for years to come.